Excerpt of a great archived article from the Stockman Grassfarmer and Alan Nation. If you don't have a subscription to this unique publication, you should put it on your to do list to subscribe - whether you are a meat producer, or a consumer, it's a pleasure to read and will help you understand just what is a healthy pleasure to eat. Click the blog title link for the complete article. "When you think of French food what do you think of? Over fattened geese? Snails? Heavy sauces? Coq au vin? Paris native, Jerome Chateau, said that a far more typical French meal would be steak and fries. (They aren't called French fries in France.) "
"He said the French are by far and away the biggest beef consumers in Europe and treasure a tender, flavorful, grilled steak. The only major difference between French beef eating tradition and North America is that the French tend to eat their grilled steaks rarer and are more lavish with the use of salt and pepper." "Chateau said the wide-spread American belief that meat from older animals has to be tough strikes most Frenchmen as incredibly naive. In fact, given the choice - as they are - the extremely picky French actually prefer their beef to be from older animals." "Only 11 percent of France's internal beef consumption comes from animals less than two years of age and only two percent is from young males (mostly as dairy veal). Eighty seven percent of internally consumed beef is grass finished and 75 percent of French beef consumption is from culled cows - of both beef and dairy breeds. "He said there were dozens of breeds of cattle in France. Each is bred to work in the highly varying climatic regions of the country. These adapted cattle traditionally take that region's name as the breed's name. For example, Charolais, Tarentaise, Normande (bull pictured above ;jlw), and Simmental." "He said he believed the primary cause of beef toughness was stress on the animal. He said the French are very cognizant of this fact and genetically select for docile and quiet animals." French dairy cows that are to be sold for beef are allowed to graze and fatten for at least 90 days after being dried off. He said a typical practice was to dry the cows off in the winter and sell them as beef the following summer after they had fattened on the lush spring grass. "At the abattoir French cattle are individually penned and never mixed with strange cattle. Free choice water is available to them at all times including during road transport. Many abattoirs play Classical music in their holding areas to calm the cattle handlers and possibly the cattle." 1. The cattle have to have been on one farm for at least four months before slaughter. 2. The cattle must spend at least eight months of the year on pasture. 3. The cattle must not spend over four hours on the truck to the abattoir. 4. The cattle must not stand for over 24 hours at the abattoir before slaughter. 5. The cattle are to be kept in individual stalls with free-choice water. 6. The cattle must be handled with a minimum of disruption. 7. The beef must be aged for seven days as a carcass or for 12 days in plastic wrap as individual pieces." 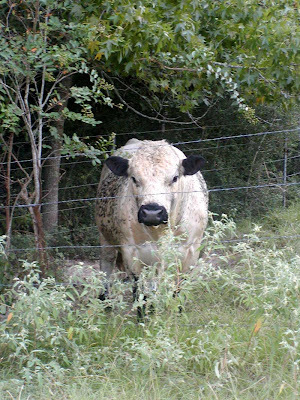 Follow the blog title link to the Pineywoods Cattle Association's listing of cattle for sale. Amazingly, there is a bit of a predominance of the white Park color pattern in this old American breed. But perhaps I shouldn't be so amazed, after all this same color pattern is present in the Texas Longhorn. Every British White breeder in Texas is well familiar with their calves getting docked at their local auction barn for being 'longhorns'. If you don't ask to see the scribbles on the auction ticket when you drop your cattle off, you can be assured they designated your British White cattle as Longhorns. Even if you correct the fella checking in your cattle, the order buyers really don't care. They've been buying British White crossbred cattle at a low ball price for years, and no doubt they like it that way. So stand up when your fat calves are on the auction barn floor and let the crowd know what they are. 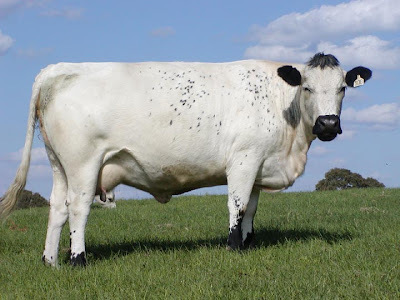 I bought my first British White, my old bull 'Doc', from the late Bob Stanley. I recall Bob telling me how hard he'd worked to promote both his cattle and the breed at his local auction barn, and he was excited at the response to his efforts. Bob Stanley had a good eye for cattle and no doubt brought first rate calves to the local barn. The offpsring of Bob's herd of Britsh White cattle are important genetics in our breed today. Unfortunately, I was not able to provide a photo as an example of a Pineywoods cow with white Park markings; but, just follow the link to the their site. And take note of the pretty horns of these Pineywood cattle! Look familiar? There are a myriad of examples of the white Park color pattern historically present in some very old and respected breeds, including the Galloway, the Durham, the Welsh White (now only black), the Longhorn, the Highland, and the Shorthorn. Global Economic Recovery or Chinese Stockpiling of Commodities? To continue the blog thread here about the significance of the performance of the Baltic Dry Index, here are some excerpts from "Where's the Economy Headed? Insiders Watch This Key Index", Published: Wednesday, 26 Aug 2009, By: Jeff Cox, CNBC.com . For some analysts, the shipping index's plunge is indicative that the slowdown in demand for shipping will mean more troubles for the US economy, despite its recent signs of growth that have led some to call the recession over. Thus, the increasing popularity of the BDI as a yardstick. "The reason it's becoming more popular is it has been a very accurate indicator of recessions," says Tony Sagami, editor of Weiss Research's Asia Stock Alert newsletter. Sagami sees the BDI drop as showing a fall in metals prices, which generally portends an economic slowdown; signal of a short-term correction in the Chinese markets; and a sign that the global economy remains in trouble. "The US is headed for a Japanese-style recession," says Sagami, who recommends investors increase cash positions. The rise in the U.S. stock market off it's scary March lows has been nothing short of phnenomenal. Much of the increase that's been hailed as so promising is the bounce back of a lot of commodities, mostly not the agricultural kind, soybeans being an exception. Anyone could have thrown a dart at a group of steel stocks and had themselves a winner from April to August. But is the rise in price of steel, copper, and other various hard commodities sustainable? As far back as at least June it was noted that China was actually stockpiling commodities, rather than buying them up for use in the normal course of the business of their once bustling economy. There is lots of speculation as to why China is stockpiling these basic essential commodities. The scariest reason proposed is that this hoarding of economic essentials is in anticipation of a drastic collapse in the value of the Dollar. In effect, it is China's way of hedging against a possible collapse of the dollar. If China, the largest foreign holder of our national debt, deems it prudent to hedge against the collapse of the dollar, it would be wise for the individual investor to take note and take care to have themselves hedged against the very real possibility. But back to the Baltic Dry Index. If you look at the chart of the BDI you see a blip upwards beginning early April and beginning to falter by the end of June, marking the beginning of a downward trend that continues today. Despite this, the Dow continued it's phenomenal run upwards, with only one barely noticeable blip down in July. The HangSeng index on the other hand began a downward move toward the end of July, the beginning of which correlates well with that tiny little July blip down of the DOW. Which market is living in the real world? Your guess is as good as mine. China's commodity stockpiling materially contributed to that blip up in the BDI. Essentially, that makes it an articifical blip upward -- not a rise in shipping traffic and freight rates due to 'normal' rising global demand indicative of a recovering world economy. Featherstone says the farm economy and the general economy do not always move together, since the linkage is an inverse one that has farm income low when the US GDP is higher. He points to the relationship between the US stock market and the Illinois corn price and says the correlation has been nearly neutral since 1960, "Therefore, while the general U.S. economy may be slow there appears to be little long term evidence that there will be major spillovers into the U.S. farm economy. In fact, based on history, it is more likely that the agricultural economy and the general economy are inversely related." The Kansas State economist says the overall strength of the farm economy is as strong as it has been in nearly 20 years and . . . if farm income remains high, so will land values, but if incomes fall, there is a good chance for declines in land values, and he says USDA forecasts have a lot of uncertainty about future farm income. Given Featherstone's warning about declining farm income and land prices, does he think farm income will drop? He says US agriculture has been reliant on trade, but the trade surplus agriculture enjoys will decline more than 50% this year due to reduced overseas demand. That will impact different commodities and will impact farmers who produce those commodities, "A reduction in agricultural exports may lead to a building of commodity surpluses (stocks) and a reduction in crop prices and ultimately net farm income." And he says the two prior "busts" in the land market were caused in part by a softer global demand for US farm products. Featherstone inadvertently provides part of the answer to why the Baltic Dry Index, normally a leading forward indicator to a period of rising economic bliss, has actually lagged markedly behind the current stock market rally. Featherstone indicates there has been a more than 50% decline in overseas demand for our commodities 'this year', and all those commodities would have been transported on various types of ships to many foreign ports. If demand for basic commodities produced in the USA remains 50% and more below normal, that would necessarily have a continuing material impact on freight rates as measured by the Baltic Dry Index. While Featherstone doesn't address where he sees demand for our commodities in the coming year, the tone of the interview is on the negative side for a rapid global recovery and increased demand for our commodities in the coming months. Click the blog title link above for the full text of the8/26/09 article by Stu Ellis. Reconciling the up beat stock market returns of the last several weeks with any sort of economic reality just gets harder and harder. The American consumer is supposed to be looking at things from a positive perspective now and voila' the economy of the USA will be booming within the year. Or not. The Baltic Dry Index (BDI), a reflection of demand for ships carrying a wide variety of materials and finished product to all ports around the world, is barely tug tugging ahead from its unprecedented lows of 2009. The BDI generally is something of a leading indicator to either rallies or routs, but not so in this current dazzling stock market rally. Basic agricultural commodities are somewhat mixed, but as a whole generally are not far off their average basket price in 2007 prior to the last huge run up in oil, as reflected in the chart of DBA, an agricultural commodities ETF that reflects a basket of sorts of primary ag related commodities. For the rancher with hungry bovines to feed, that's good news. We don't wish to see commodities prices jump up along with this crazy market. But then there's that inflation question? Just how will the expected gross inflation from irresponsible government spending and massive debt impact the price of commodities? Not having the smarts to answer that question myself, I'll avoid it here. There are ample analysts with educated opinions about the direction of basic commodities in a staggering inflationary economy. I'm actually most curious as to why commodities have managed to stay out of the current rally, given that their basic demand is driven by the consumer and of course ethanol producers, whose business in turn is driven by basic consumption. As I mentioned, for the cattle rancher, it's good news that so far commodities have at least maintained their average back track to 2007 levels, we have those hungry bovines to feed after all. What is really interesting to observe is that COW futures are tracking the bottom of the market, at least to my eyes. In addition to, or instead of, owning actual cows, investors can buy what some call an E-COW. COW is the symbol for an ETF that tracks cattle futures. Wow, take a look at that chart. COW is even lower than it was in March of 2009 when all markets in general took a nose dive. COW just keeps getting lower and lower, the winner of the how-low-can-you-go Limbo game, but COW looks like the only major Limbo player. If the US economy is rebounding so nicely, why is COW still playing Limbo? Has the American consumer decided that foregoing some beef for dinner wasn't so hard, and now they've lost their taste for hamburger? After all, the consumer is bringing our economy back. Right? Are American consumers becoming more 'green' oriented? Some of them deciding to do their bit to help global warming by not eating beef from a farting beast? It looks like maybe 9% of them are perhaps doing just that. After all, we're told the economy is on the road back, folks should have been buying more beef in at least June and July when suddenly the economy of the country started looking rosy. Yet consumer demand for beef has dropped 9% in the last 9 months, per Cattle Max. If you think this is the bottom for beef, maybe it's time to buy some momma cows for your pastures, or jump out there and buy an E-COW, or how about one of those small feedlots that are headed for bankruptcy and closure as discussed in the article below. After all, "the country has the lowest calf crop since 1999 and fewest cattle on feed since 1999". Where is the government bail-out for those small feedlots? How about the Obamanomics gurus start issuing cash-back coupons for folks to buy a nice chuck roast? Oh yeah, they probably want to shrink the number of cattle feedlots cause of all that methane gas, have the common folk become vegetarian, and keep those really nice rib-eyes for those elite White House suppers. Lightbulb! Maybe the White House would like to have a few hundred elite rib eyes from the herds of British White cattle? British White beef producers should work on that, the White House could literally consume all the beautiful grass fed British White beef produced. And it's fitting, the beef of old royalty on the dinner plate of new American royalty. I like that! Maybe that's a niche British White breeders should pursue. As a side note, I am not fond of the seemingly nasty environment of feedlots. And my awesome cow, Bountiful, just closes her eyes in dismay at the mere thought of one of her babies ever stepping foot into their muddy pens. But, it is impossible to provide beef to the majority of American consumers without feedlots. Perhaps more people are choosing to buy beef direct from the family farm and that is contributing to the decline in demand for the industrial sort of beef.....but I imagine that is as much a pipe dream as believing the current stock market razzle dazzle of a strong economy just around the corner. Chillingham Cattle - Black ears or Red? - Local 'tame' cows turned out to pasture with the wild Chillingham herd! Above we find reference to the preference for the black-eared ones, as well as a clear indication of the Size of the cattle. Those not at Chillingham were "much larger" weighing about "50 stone" which equates to about 700 lbs, easily 40% of the average weight of a domestic cow in the USA today. As a side note, there are many early references to the Chillingham cattle having black points. Those pocket-book politics I've referred to before came to a resounding head in modern times, as well as in the late 19th and early 20th century, to try to present the Chillingham herd as something distinct, purely preserved, and genetically linked back to the ancient urus/aurochs of Britain -- even in the 19th century many writers found this notion absurd. The reality is that the Chillingham herd itself has at least once been down to one female in calf who produced a bull sometime between 1776 and 1836, based on various writers descriptions of the existing stock. "The stock at Chillingham was once reduced to a cow in calf. The produce fortunately proved a bull." (Jardine, 1836). It is inconceivable that this bull was not crossed with locally desirable cattle. As well there are ample sources which tell us that English Longhorn, Welsh Black/White, and Highland were used to perpetuate the breed type. It is truly absurd that in the present day the horned Chillingham cattle are perceived as being more closely kin to the ancient auroch that roamed the British Isles than any other bovine beast -- this notion has been greeted with educated skepticism from it's first pronouncement from the Lord of Chillingham in the early 19th century. I'm not sure how these wild Chillingham cattle were penned and the tames ones subsequently sorted off. Based on the following excerpt from Youatt's, The Complete Grazier, 1893, the Chillingham calves apparently couldn't even be weaned from their dams. "In some parts of Surry there is a white sort of cows that it is reported produce the richest milk and their fleh more readily receives salt than any of the other." "The white breed of kine(cow) were some time ago very frequent in Lincolnshire from whence a gentleman brought them into Surry as a curiosity. They are of different make and much larger than the black cattle, give more milk at a meal, but grow dry the soonest of the three." "The ancient parish, quite or nearly identical with Hamilton parish, was variously called Cadyhou, Cadyou, and Cadzow; and it changed that name to Hamilton in 1445." The ancient forest surrounds the castle; contains, on the opposite side of the Avon, the summer-house of Chatelherault, built in 1730; is now called Hamilton Wood; comprises about 1500 acres; is browsed by a noble herd of fallow deer; and is the scene of Sir Walter Scott's famous ballad of Cadzow Castle. Of it Mr Rt. Hutchison writes, . . . surrounded by a stone wall 6 feet high and about 3 miles in extent, which was most probably the boundary in feudal times. . .
Sir Walter Scott spent the Christmas of 1801 at Hamilton Palace. Must read Link to Annals of the Andersonian Naturalist's Society commenting on the visit of Sir Walter Scot to the Hamilton herd in Scotland. And drowns the hunter's pealing horn. The Mountain Bull comes thundering on.. He rolls his eyes of swarthy glow. And tosses high his mane of snow. His roar is sunk in hollow groan. The hunters rest the idle spear. Where yeomen light the woodland. "It is highly probable that Sir Walter Scott's ballad awakened the interest of the ducal family, and that a successful attempt to form or collect a herd was made, either from a few survivors of the former one that had been kept somewhere else, or from a distinct one. Under any circumstances a small herd of white cattle, numbering about a score, were browsing in Cadzow by 1809, and the cows being horned and the bulls humble (means POLLED) would seem to indicate a herd in process of formation from different sources. Later the whole herd became humble. For twenty-five years past, at least, they have been all horned." Global Warming - Cow Belches and Farts - Paul McCartney? Hot news yesterday on CNN was an interview with Paul McCartney. He's asking folks to go one day a year without eating meat. Why? To help combat global warming. Those cow farts and belches just produce too much methane gas. How about he asks folks to give up pinto beans for several days a year, surely the gas humans produce impact global warming as well -- I'll have to check on that. The newscaster went on to quote stats that 18% of the methane gas produced is from livestock, and a mere 13% was the result of all the automobiles running the highways. It seems a cattle rancher driving a hybrid is way more destructive than a suburbanite driving a gas guzzling suburban. Just about every time the news media covers the methane gas produced by livestock, they show a video clip of cattle, generally at pasture. Video footage of a nasty and cattle-crowded feedlot is apparently not their first choice to demonstrate those awful gas producing bovines that are a key culprit in global warming. But these are not the only advantages which man derives from the ox. Without the aid of this useful animal, both the poor and the opulent would find great difficulty in procuring subsistence; the earth would remain uncultivated; our fields and gardens would become parched and barren. All the labour of the country depends upon him. He is the most advantageous domestic of the farmer. He is the very source and support of agriculture. Formerly the ox constituted the whole riches of mankind; and he is still the basis of the riches of nations, which subsist and flourish in proportion only to the cultivation of their lands and the number of their cattle: For in these all real wealth consists; every other kind, even gold and silver, being only fictitious representations, have no value, but what is conferred on them by the productions of the earth. Of those animals which man forms into flocks, and whose multiplication is his principal object, the females are more useful than the males. The produce of the cow is almost perpetually renewed. The flesh of the calf is equally wholesome and delicate; the milk is an excellent food, especially for children; butter is used in most of our dishes; and cheese is the principal nourishment of our peasants. How many poor families are reduced to the necessity of living entirely on their cow? Those very men, who toil from morning to night, who groan and are bowed down with the labour of ploughing the ground, obtain nothing from the earth but black bread, and are obliged to yield to others the flour and substantial part of the grain. They raise rich crops, but not for themselves. Those men who breed and multiply our cattle, who spend their whole lives in rearing and guarding them from injuries, are debarred from enjoying the fruits of their labour. They are denied the use of flesh, and obliged, by their condition, or rather by the cruelty of the opulent, to live, like horses, upon barley, oats, coarse pot-herbs, &c.
Even today, there are many small cattle ranchers that do not eat the beef they raise because they need the proceeds from selling their livestock. They eat cheaper meat, and less meat than perhaps they would prefer -- a modern version of what Buffon describes in the late 1700's. The rising costs of inputs over the past few years (mostly due to that corn ethanol boon-doggle)to raise cattle and to keep pastures fertile has strapped the small beef producer. Oftentimes they can only just break-even for all their efforts to provide beef to the USA, and too many actually lose money at this endeavor. Something is quite morally wrong about that. Something is also quite morally wrong about targeting cows as key villains in this so-called Global Warming crisis. The extreme left wing liberals, like Paul McCartney, would have you believe they are looking out for the working class, the little people -- nothing could be farther from the truth. The long term ramifications of implementing their pie in the sky philosophies and beliefs may well lead to another era of poor diets for the poor such as Buffon so succinctly described as existing over 200 years ago and beyond. Of course, the really poorest of the poor will get more and more food stamps I imagine, and they can buy whatever they want at the supermarket -- but the hard working poor will not. The following are excerpts of an 1836 book from the highly respected and much published Sir William Jardine. These excerpts clearly establish the polled Park cattle (now known as British White) as not only a treasured heritage breed in the early 1800's, but also as a distinctly different body type over those of the horned Chillingham herd. 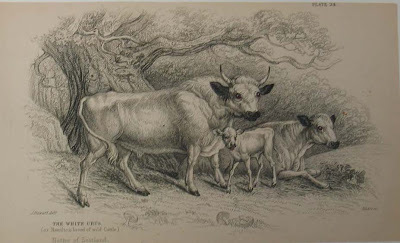 The horned Chillingham cattle are purported to have been kept in isolation and the bloodlines pure through the 20th century (the works of other early 19th century authors have proven this to be a false statement, and Sir William also notes that at one point prior to 1836 there was only ONE horned Park animal left in the Chillingham herd.) "The stock at Chillingham was once reduced to a cow in calf. The produce fortunately proved a bull." Which Chillingham obviously used for cross-breeding in order to re-populate their herd, and it's a solid assumption that stock from the Hamilton/Cadzow herd were likely used as well in building their herd anew. "The (once wild white cattle)most remarkable now are the parks of Chillingham in Northumberland, the property of Lord Tankerville, and that of Hamilton Palace in Lanarkshire, where the drawing for the accompanying illustration was made. This very ancient and peculiar breed of cattle has been long kept up with great care by the noble family of Hamilton in a chase in the vicinity of their splendid seat at Hamilton, in the Middle Ward of the county of Lanark. They are generally believed to be the remains of the ancient breed of white cattle which were found on the island when the Romans first visited it, and which they (the Romans) represent as then running wild in the woods." ". . .The chase in which they browse was formerly a park or forest attached to the Royal castle of Cadzow where the ancient British kings of Strathclyde and subsequently kings of Scotland used frequently to reside and to hold their courts. The oaks with which the park is studded over are evidently very ancient and many of them are of enormous size. Some of these are English oaks and are supposed to have been planted by King David, first Earl of Huntingdon about the year 1140. The chase is altogether of princely dimensions and appearance amounting to upwards of 1300 Scotch acres. The number of white cattle at present kept is upwards of sixty. Great care is taken to prevent the domestic bull from crossing the breed and if accidentally a cross should take place the young is destroyed. In their general habits they resemble the fallow deer more than any other domestic animal. Having been exposed without shade or covering of any sort to the rigours of our climate from time immemorial, they are exceedingly hardy and having never been caught or subjected to the sway of man they are necessarily peculiarly wild and untractable." "Their affection for their young, like that of many other animals in a wild or half wild state, is excessive. When dropt they carefully conceal them among long grass or weeds in some brushwood or thicket and approach them cautiously twice or thrice a day for the purpose of supplying them with the necessary nourishment. On these occasions it is not a little dangerous to approach the place of retreat, the parent cow being seldom at any great distance and always attacking any person or animal approaching it with the utmost resolution and fury." "The young calves when unexpectedly approached betray great trepidation by throwing their ears back close upon their necks and lying squat down upon the ground. When hard pressed they have been known to run at their keepers in a butting menacing attitude in order to force their retreat. The young are produced at all seasons of the year but chiefly in spring. The mode of catching the calves is to steal upon them whilst slumbering or sleeping in their retreat when they are a day or two old, and put a cloth over their mouths to prevent them crying, and then carry them off to a place of safety without the reach of the herd; otherwise, the cry of the calf would attract the dam and she, by loud bellowing, would bring the whole flock to the spot to attack the keeper in the most furious manner." "These cattle are seldom seen scattering themselves indiscriminately over the pasture like other breeds of cattle, but are generally observed to feed in a flock. They are very wary of being approached by strangers, and seem to have the power of smelling them at a great distance. When any one approaches them unexpectedly they generally go off to a little distance to the leeward and then turn round in a body to smell him. In these gambols they invariably affect circles, and when they do make an attack, which is seldom the case, should they miss the object of their aim they never return upon it, but run straight forward without ever venturing to look back. The only method of slaughtering these animals is by shooting at them. When the keepers approach them for this purpose they seem perfectly aware of their danger, and always gallop away with great speed in a dense mass, preserving a profound silence and generally keeping by the sides of the fields and fences"
"The cows which have young in the meantime forsake the flock and repair to the places where their calves are concealed, where with flaming eyeballs and palpitating hearts they seem resolved to maintain their ground at all hazards The shooters always take care to avoid these retreats. When the object of pursuit is one of the older bulls of the flock the shooting of it is a very hazardous employment. Some of these have been known to receive as many as eleven bullets without one of them piercing their skulls. 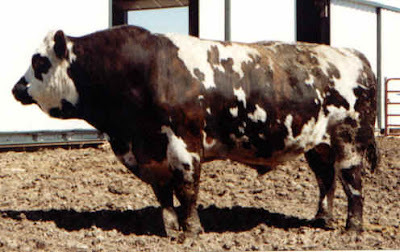 When fretted in this manner they often become furious and owing to their great swiftness and prodigious strength they are then regarded as objects of no ordinary dread"
"They (the Hamilton white cattle) are larger and more robust in the general form of their bodies, and their markings are also very different. In the Tankerville breed the colour is invariably white, muzzle black, the whole of the inside of the ear and about one third of the outside from the tip downwards red. (they were black muzzled and red eared, no doubt mineral deficient) The horns are very fine white with black tips and the head and legs are slender and elegant. In the Hamilton Urus, the body is dun white, the inside of the ears, the muzzle, and the hoofs black; and the fore part of the leg from the knee downwards mottled with black. The cows seldom have horns, their bodies are thick and short, their limbs are stouter, and their heads much rounder than in the Tankerville breed. The inside or roof of the mouth is black or spotted with black. The tongue is black and generally tipped with black. It is somewhat larger in proportion than that of the common cow, and the high ridge on the upper surface near to the insertion of the tongue is also very prominent. 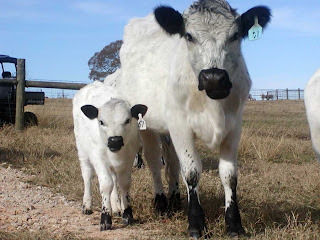 It is observable that the calves that are off the usual markings are either entirely black or entirely white or black and white, but never red or brown." "The beef like that of the Tankerville breed is marbled and of excellent flavour and the juice is richer and of a lighter colour than in ordinary butcher meat. The size of the smaller cows does not exceed fifteen stones, . . . weight but some of the larger sort especially the bulls average from thirty five to forty five stones. The circumstances of their breeding in, and of beng chased so much when any of them are to be shot, of being so frequently approached and disturbed by strangers, and of having been exposed so long to all the vicissitudes of the seasons and constantly browsing the same pasture, have no doubt contributed greatly to the deterioration of the breed and must have reduced them much in size and other qualities." "The favourite haunt of these animals in ancient times seems to have been the Caledonia Sylva or Caledonian Forest . . . . dividing the Picts from the Scots and being well furnished with game, especially with fierce white bulls and kine(means cow). It was the place of both their huntings and of their greatest controversies." "The Roman historians delight much to talk of the furious white bulls which the Forest of Caledonia brought forth." "In the sixteenth century they seem to have become entirely extinct as a wild race, and as we learn from Meaner, were all slain except in that part which is called Cummernad. Another author informs us that ". . .thocht thir bulls were bred in sindry boundis of the Colidin Wod (Caledonian Forest today) now be continewal hunting and lust of insolent men they are destroyit in all parts of Scotland and nane of them left but allenerlie in Cumernald." At what period the present breed were introduced to the royal chase at Cadzow cannot now be well ascertained. It is well known that the Cummings were at one period proprietors of Cadzow and Cumbernauld; and it is likely that in their time the white cattle were in both places. But be that as it may, they have long been extirpated at Cumbernauld, while they have been preserved in great perfection at Hamilton." ". . . .The universal tradition in Clydesdale is that they have been at Cadzow from the remotest antiquity, and the probability is that they are a part remaining of the establishment of our ancient British and Scottish kings. At present they are objects of great curiosity, both to the inhabitants and to strangers visiting the place. During the troubles consequent on the death of Charles I and the usurpation of Cromwell, they were nearly extirpated; but a breed of them having been retained for the Hamilton family by Hamilton Dalzell and by Lord El phingstone at Cumbernauld they were subsequently restored in their original purity." In the midst of this really bad economy, at least corn prices have backed off their record highs, though how much that's reflected in the price of a bag of feed at your local feed store is quite variable. Once a higher price point is reached, it takes a while for the retail products to see a matching decline, if ever. While I don't feed corn to my cattle, I'm very aware of how the rising price of corn and other grains used in ethanol production has negatively impacted the value of livestock in the USA. One possible hint of relief from the disastrous impact of increasing corn ethanol production is the growing research and ingenuity in designing electric cars, and getting our vehicles and machinery out of the lead acid battery dark ages (Lead-acid batteries were invented in 1859 by French physicist Gaston Planté.) Also a possible source of relief from dependence on ethanol and fossil fuels is solar energy. These collective alternative energy areas received much play in the days of the last presidential campaign. Theoretically, we now have an administration and Congress that has provided for the subsidy of these expensive new technologies (In most of Europe, the government has subsidized alternative energy growth with great success.) However, of the mere $6 Billion or so that was designated for alternative energy in the Trillion Dollar Stimulus Bill, Congress now proposes to riddle the original concept with red tape and wrinkles, and even worse they propose to take ~$2 Billion dollars of the $6 Billion, and divert those monies to the Cash for Clunkers money pit (IMO). Where is the logic there? I've not even noticed this focused on in the news! Alternative energy companies are a natural to put folks back to work in places like Michigan where solar companies are already positioned and there is a ready labor force for production of solar panels and batteries, etc... Yet, this piddling bit of $6 Billion dollars for alternative energy has not only been NOT disbursed, it is now in danger of being given away to a program that pulls money out of your pocket and straight into the pocket of the automotive industry. In no way does this help the USA get off the ethanol track and put our corn back to use as Food for ourselves and our livestock. Ethanol crush spreads have strengthened over the past few months, driven by lower natural gas and corn prices plus stable ethanol prices. Ethanol production volumes have been kept in check, helping to support ethanol pricing. Cash margins for ethanol producers have again turned positive. Follow this link for the full Credit Suisse comments and analysis regarding the Cash for Clunkers ripping off the Alternative Energy sector. The Texas and Southwestern Cattle Raisers Association (TSCRA) email update yesterday included a call to members to contact their Congressman during this August recess to express their Support and Opposition to critical legislation that will have a huge impact on our economic lives as cattle raisers. I've included links where I could find them, to the actual text of the bills at issue. Perusing the actual text of the bills is enlightening, and something I think we all should do more often in these days of minimal debate and rapid passage of bills which will effect our lives in both Texas and the USA. The Affordable Food and Fuel for America Act ". . .would phase out government subsidies for corn-based ethanol over five years and promote the commercial development of second generation biofuels. This legislation would force corn-based ethanol to become commercially viable without the assistance of government dollars and eliminate competition with other commodities that use corn"
In 2008, I blogged on the devastation that I percieve has been and will continue to occur in the USA as a result of the government's blind and dumb subsidy of corn ethanol. Not only is it forever changing the landscape and air quality of states such as Nebraska and Minnesota, it is forever changing the economics of our food supply. In particular to cattle raisers, it has increased the input cost of feedlots to a point of zero profitability at times, and thus the value of our feeder calf crops at market is reduced. The Family Farm Preservation and Conservation Estate Tax Act(couldn't find a direct link to this bill) ". . .would exempt working farm and ranch land from the death tax, as long as the land is kept in production agriculture. The bill also provides estate tax relief for land under qualified conservation easements." I could find no link to the text of this bill, instead I found references to it being from the 2007/2008 legislative sessions. TSCRA's summation of it's benefits to the continuation of family farms, rather than their liquidation due to death, makes it clear this is a bill we should all want passed. The Clean Water Restoration Act ". . .would expand federal control over all wet areas within Texas including stock tanks, drainage ditches, ponds, small and intermittent streams, creek beds, playa lakes and mud holes." The impact of this legislation on every day life in rural America is boundless, and would mire the average family farm, the average hunter or fisherman, in red tape and legalities that will forever change our historical and current concept of private land ownership and freedom to live as we wish on our land. The American Clean Energy and Security Act (the Cap & Trade Bill) ". . .will drastically increase the costs of fuel, electricity, feed, fertilizer, equipment and other production costs necessary to run a successful ranching business. The costs to ranchers far outweigh any benefits this legislation offers." I absolutely need to read and try to understand for myself the impact of this bill. It is somehow still shrouded in mystery to me despite my obsession with the news. One has the sense that it is the ultimate boogey-man of bills, without even understanding the actual mechanics of its impact on our economy today and in the future. One thing that is abundantly clear, is major corporations such as General Electric stand to benefit hugely from the passage of this bill.